«©NCSX» Kaiyodo releases Monsieur Bome Collection Vol. 8 which features a version of KOS-MOS from the Xenosaga game. While not as beautifully sculpted and painted as the 1/8 scale variant of KOS-MOS from manufacturer Alter (which is also expected this week), the Mon-sieur Bome interpretation has its strengths. For one, KOS doesn't twist in the Bome version and stands straight, like a wooden plank, to allows for head-on viewing of her armor, arm coverings, and garters. From behind, KOS' blue locks flow in luxurious fashion. 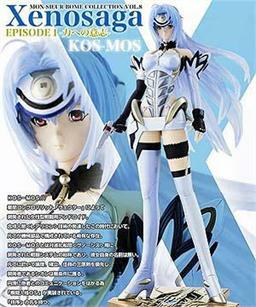 Similar to other Bome figures, KOS-MOS is tucked inside a standard blister pack with a mounting base for display purposes. A pistol is included for Kos-Mos to grip. When we originally started preorders for this particular figure, Kaiyodo's photos made KOS appear chunky instead of her usual svelte self. Now that we have the figure in hand, we can confirm that KOS is still svelte with a curvy arch that starts at the small of her back and rides up to her laid-back shoulders. The sculpt is beautifully chiseled with KOS' dainty features surrounded by shocks of blue hair that seemingly frame her face. Her helmet and body armor are painted on like a second skin - no bleeding, fading, or specks to ruin the illusion. Even the micro text etched on her helmet which reads "KOS MOS" is perfectly applied without bleed or fade problems. KOS measures 21cm or roughly 8.25" tall. There are thousands of models that I would like to make. But at the same time, there are thousands of reasons why I can't make them all. There are copyright issues, salability issues, and sometimes even technical issues preventing me from making some models; in short, there are all sorts of setbacks. But these setbacks give me all the more reason to think about all the models that I want to make. KOS-MOS is one of those models; I wanted to make her ever since I first saw her 4 years ago, but at the time I didn't feel like my technique could do her justice. But my desire to make her never wavered, and finally in 2005 I decided to go ahead with production. I threw an extra Zohar in there too - it's the base of the model, so feel free to do with it what you like. Also, thank you to Namco for allowing the final promotional changes to be made, and to Monolith Software for assistance overseeing the project. View larger photos on the main NCSX site. This document is ©NCSX 2005, 2007, 2009. All rights reserved. No reproduction in whole or in part of this document may be made without express written consent of National Console Support, Inc.